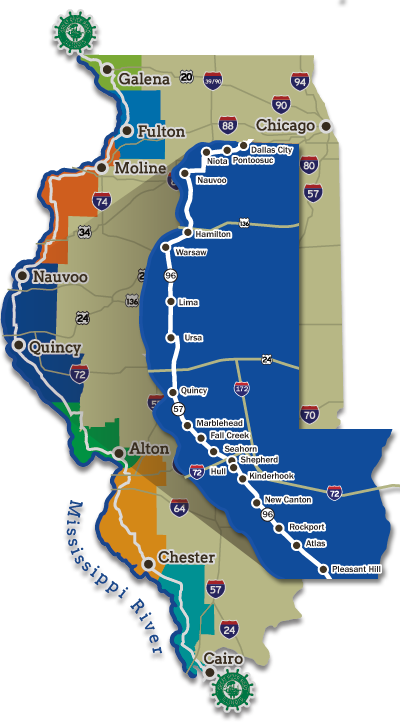 The Quincy Area is located on the Mississippi River banks along the Great River Road National Scenic Byway. Quincy is home to a thriving cultural community and the nation's first Arts council. Quincy architecture represents 3,664 buildings on the National Register, complimented by custom Private Home Tours in the East End Historic District. The Mississippi Valley Wine Trail and the Golden Hunting Triangle encompass this fertile western region of the state. To the north, Historic Nauvoo brings over 45 free historic sites to life year-round. South of Quincy, Pike County is a recreational heaven with pristine lodges and top hunting grounds.